The Rüppell’s vulture or Rüppell’s griffon vulture (Gyps rueppellii Brehm, 1852), belongs to the order of the Accipitriformes and to the family of the Accipitridae and is one of the biggest African vultures. It is quite easy to mistake it with the other three African conspecifics (Gyps fulvus, Gyps africanus and Gyps coprotheres) for the size as well as for the colour that, in particular among the juveniles, is very similar. Furthermore, it shares with the most of the territory and of habits, excepting the Gyps coprotheres that is confined in the extreme southern regions of the continent. It is often said the the vultures can fly at very high altitudes without imagining what they can really reach during their vaultings. Well, this species may be considered without any doubt the bird that has ever flown highest among all species of extant birds. This has been confirmed on November 23rd 1973 in the sky of Abidjan in Ivory Coast, with the collision in flight of one specimen with a plane of the Ivorian airlines at quite 11.300 m of altitude ! Even if this height can be considered as absolutely exceptional, this bird always flies at remarkably high altitudes and usually exceeds, with absolute ease the 5.000 m.
This capacity is given by its particular blood composition that sees the presence of a protein allowing to take the maximum advantage also from the smallest present quantities of oxygen and consequently to breathe without any difficulty also at those heights where this element is rather rarefied. The scientific name Gyps comes from the Greek “gups” = vulture and the species rueppellii = of Rüppell, is named after Eduard Ruppell, German zoologist and explorer, to whom this bird was honoured. The vulgar European names are: in English – Rueppell’s Griffon, in French – Vautour de Rüppell, in German – Sperbergeier, in Spanish – Buitre Moteado ed in Japanese the quite complicated Madarashiroerihagewashi. 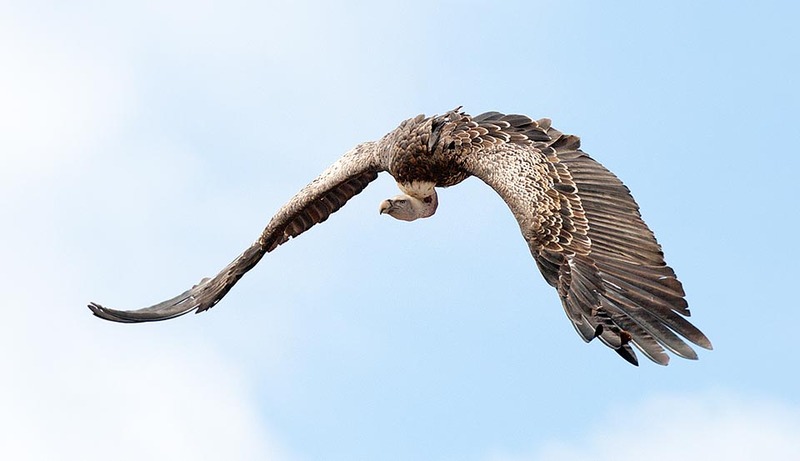 The ease in vaulting and the remarkable speed it can reach in free flight, allows this vulture to move even to distances often exceeding various tens of kilometres, even if only looking for food. It is a much sociable bird, present in numerous colonies for the nidification. 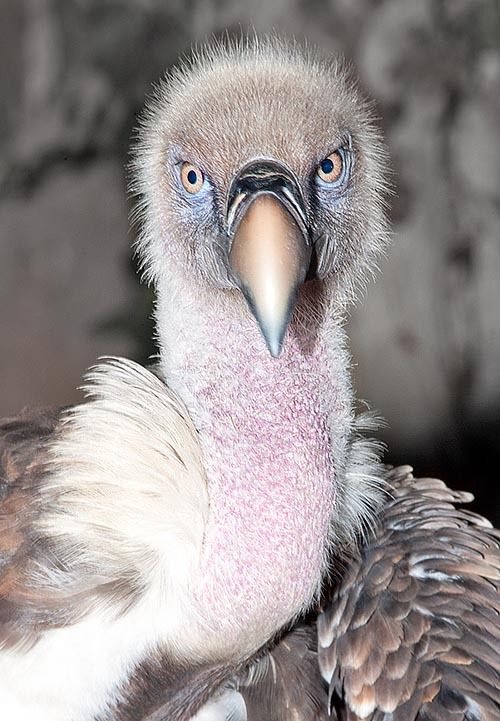 The Rüppell’s griffon vulture lives in the sub-Saharan area from Senegal up to the Horn of Africa and south up to Mozambique. It has become very rare in the western part of the African continent and even absent in the area south to the Gulf of Guinea. 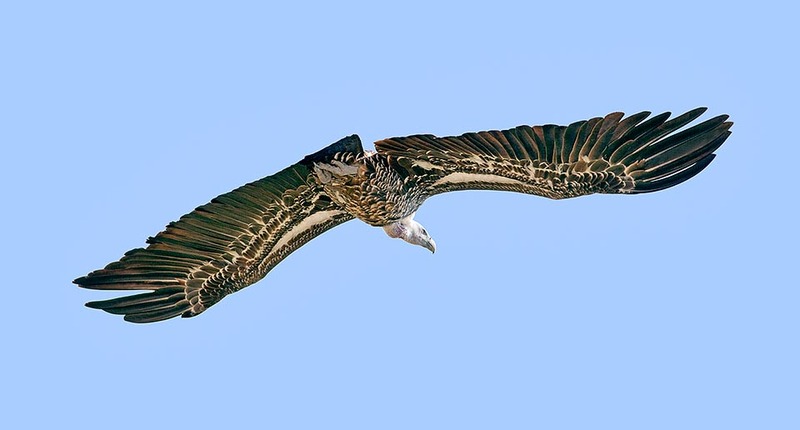 With a certain frequency some specimens are sighted also in the southern part of the Iberian Peninsula but it is thoguht that they are subjects dragged by the Griffon vulture (Gyps fulvus) during its periodical migrations towards the nesting areas. However, the nidification of this species in this area has never been ascertained. 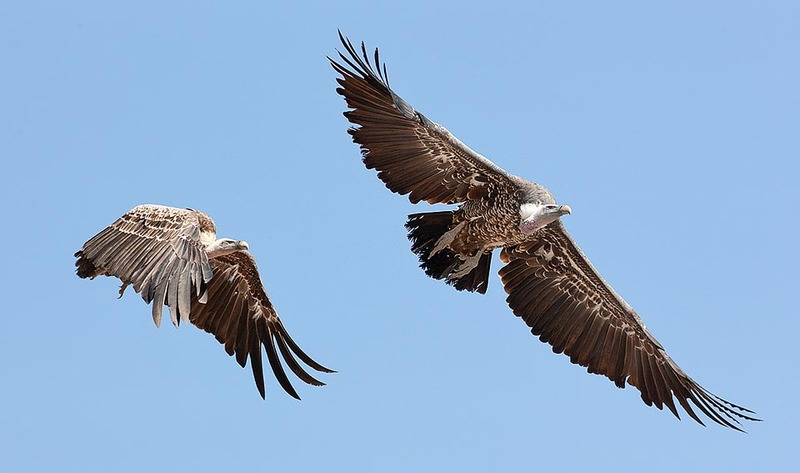 In its historical range, the Rüppell’s vulture has always been abundant but its population has met during the last decades drastic reductions that have carried it to the limit of the extinction, a fall that they are trying to avoid with strict protection and a continuous monitoring. Conversely, it is stable in the eastern part of its territor. It is found in pre-desert areas, in extremely arid zones and in mountain habitats. Amongs all vulture, it’s the one mostly seeking the presence of steep and rocky mountains, with ample gorges and vertical walls on which to place the nest. There is no doubt that the presence of the rocks and of the usual ascending winds caused by the over-heating of the rocky slopes do favour them in their usual twirls. When observing their behaviour we note that usually these birds take off a couple of hours after the sunrise, rightly awaiting that the over-heating of the atmosphere generates the formation of these breezes that raise them wihout apparent difficulty to the altitudes we were previously talking of. They are very sociable birds that use nesting in vast colonies, sharing in the mean time a quite vast hunting territory. 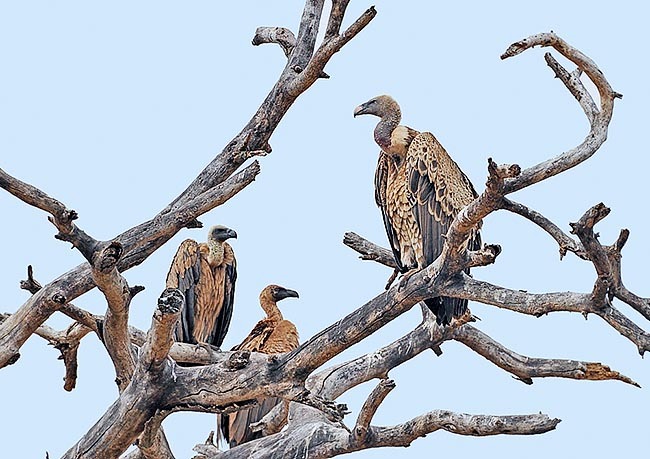 This sociability is shared while looking the carcasses as well as during the feeding even if, like all vultures, in such situation the hoarding of the food is so furious to create continuous disputes also among conspecifics. 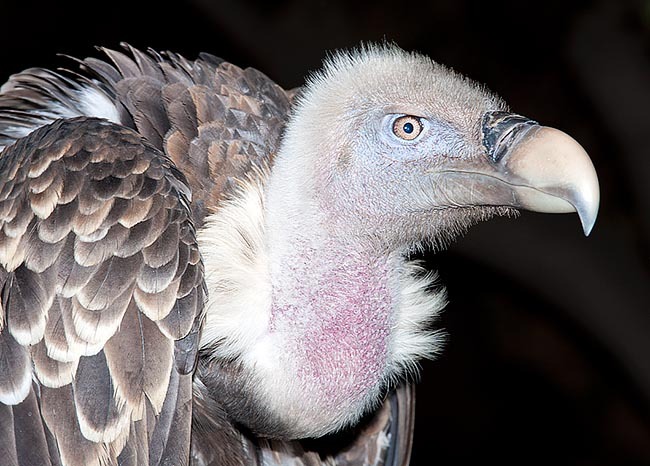 Regarding the strong diminution of the last decades it is to be kept in mind that along with other vultures this species has suffered from the consequences of the diffusion of poisoned mouthfuls made by poachers, because this birds advise unfailingly, with their flying over, the carcasses of the animals killed illegaly. In some areas contributes to the strong decrease the disturb this species gets from the free climbing new sportsmen who frequent the steep walls occupied by them obliging them unfailingly to abandon the same. Finally, as is unluckily customary in many African countries, the market of fetishes for practicing the juju, draws with full hands these vultures leading them, as has been the case in Nigeria, to their almost completely disappearance. For these various reasons, since some years, the species is considered as endangered in all its range. The Rüppell’s vulture is more than 1 m long and has a wingspan exceeding the 2,5 m.
Also the weight is remarkable, as it varies between the 6 and the 9 kg, with can reach even greater peaks when it has big quantities of food available. Often, it guzzles so much to remain perched on the ground close to the carrion for long time before being able to take off again. They have a poweeful structure placing them in the first positions and among the strongest African vultures. Both sexes are brown with head and neck covered by the usual and short whitish cere typical of the necrophagous vultures and with a ruff of the same colour delimiting the feathered part of the body. The chest is brown, amply mottled with whitish spots and also the alar coverts have the same brown colour but paler and in neat contrast with the blackish remiges. The trousers, on the contrary, are totally white. Also the underwing has various cream spots with a long white stripe parallel to the upper edge of the wing that along with other small pale lines identify the species when flying. The juveniles have slightly darker and variegated body. The eyes have yellow iris. Also this raptor has the typical beak of the big African vultures, a fairly sharp and powerful rostrum good for cutting the hardest parts of the carcasses and also to crush small bones that are then swallowed without any difficulty. The nest is a mass of twigs and dry branches placed on the highest and most inaccessible tops of the rocky walls and is very assiduously frequented every year. The nests are often very close each other but do not create apparent difficulties in the sharing of the spaces. Some times, being these structures absent, the Rüppell’s vulture contents of big trees and builds the nest on the upper crown, but this is an absolutely occasional fact. They lay only one whitish egg, with small and numerous reddish spots, hatched for about 7 weeks and the young keep in the nest for 4-5 months. 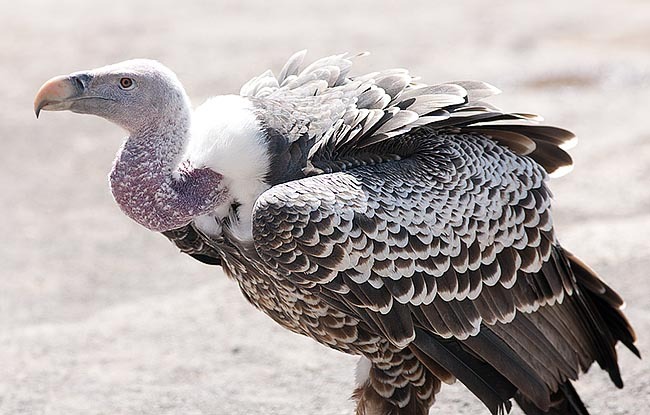 Like all vultures, they are silent for most of the year, but during the reproductive period they often emit puffs and guttural sounds. The nidification takes place in different moments depending on the territory and the latitude occupied. The synonyms are mainly due by the different spelling used while quoting the name of the German zoologist Rüppell: Gyps rueppelli Brehm, 1852; Gyps rüppelli Brehm, 1852; Gyps rüppellii Brehm, 1852; Vultur rueppellii Brehm 1852.